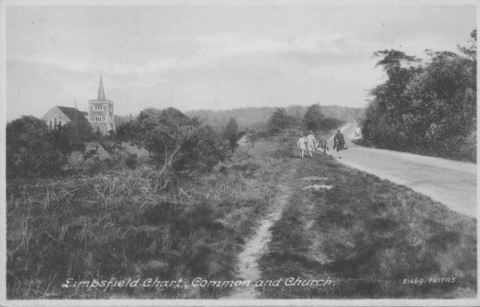 This page contains history about Limpsfield Chart, Oxted Surrey and some of the families which lived there. A contribution has been received from Len Flakeney who lives on Limpsfield Chart. See what he says beneath the pictures. Most of the pictures on this page have been sent to me by a reader in Vancouver, Canada. She is related by marriage to the Jarrett family. Her comments are in red. Here you can see Alfred Amos at work in the forge. Len says “I can confirm that the forge was actually in Limpsfield Chart. The house is still called Forge Cottage. It is located at 52 Stoneleigh Road (opposite the cricket pitch). “The picture of the horse in the forge with Amos was taken in what is now part of the back room of Forge Cottage. This is a picture of Cherry Cottage. Where is it located? View across to St. Andrew’s Church, Limpsfield Chart, Surrey from Kent Hatch Road. The road leads first to Crockham Hill, Kent and thence to Edenbridge, Kent. The iron ladder leading up to the bell tower (outside back wall St. Andrew's Church) was made by Alfred Amos Jarrett in his blacksmith shop. I believe it has been roped off for safety reasons and there was some indication that it was to be removed altogether. I do hope it will be kept. This shows the Amos family in the Forge garden. "The view in the photo is from the rear of the Forge/Cherry Cottage. It looks much the same except there is a fence between the two now." Many thanks, Len for all this. What about some present day photographs? Yes, I am related to Frank Jarrett (via his great grandfather, and my gr. gr. grandfather -Arthur Jarret, b. 1846 Limpsfield) He was a master blacksmith. There were three sons Arthur, Herbert and Alfred -- Arthur becoming an engine driver, Herbert an engine fitter and Alfred Amos, continuing the blacksmith profession - this was my gr. grandfather. In the 1901 census Arthur was publican at The Carpenter's Arms -- not sure how long for. Arthur and wife Charlotte had four children: Charles, Ronald, Herbert and John (the one mentioned on the Limpsfield Memorial). The eldest, Charles was father to the Frank you mentioned, and the grandfather of Julie Harvey (who I believe moved from Limpsfield village to The Chart a few years ago -- we met in 1998 while visiting). According to her, Charlie was an astute businessman who acquired a great deal of property . . . the blacksmiths, wheelwrights, greengrocers (Jarretts - then Garretts, now Memorial Stores, I think). He also turned his hand to bookmaking and coal mongering (a versatile opportunist, you might say!) Had two wives -- Violet Spittle, who unfortunately died three days after giving birth to twins Frank and Robert (hence the identical appearance), six children with her. Charlie then married the nanny Edith and had two more children - Eric (Julie's father) and Joyce (who used to run the Post Office on The Chart). Although my great grandfather Alfred Amos Jarrett (13 December 1873) was born in Croydon, the family soon moved back to Limpsfield Chart where he eventually helped his father run the backsmith's shop. After he married Annie Ruth Wright in 1893, they and their four daughters lived in Cherry Cottage next door to the forge. I have attached four photos taken around 1911-1915. They had been made into postcards, and two were written on and sent by Alfred Amos' eldest daughter Alfreda . . . dated October 1911. I think the titles are pretty much self explanatory. According to Len (who presently lives in Cherry Cottage), the stump of large evergreen tree (seen behind my grandfather in the Cherry Cottage photo), was only removed last year! 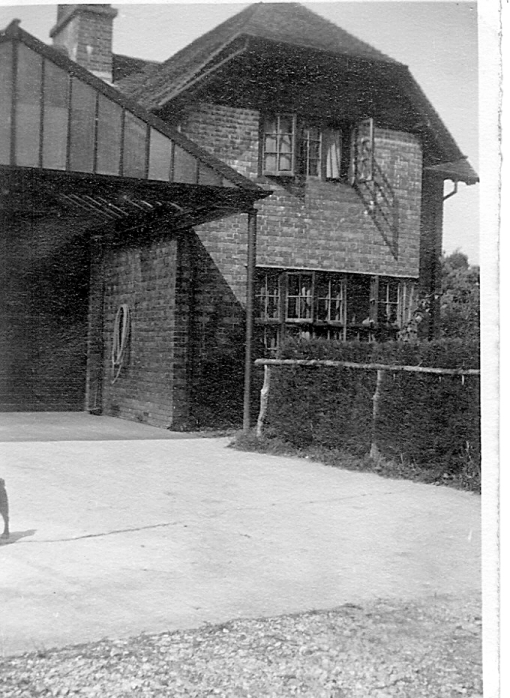 And the inside of Forge Cottage (presently lived in by Nancy Tidy) is still recognizable from the old photo. 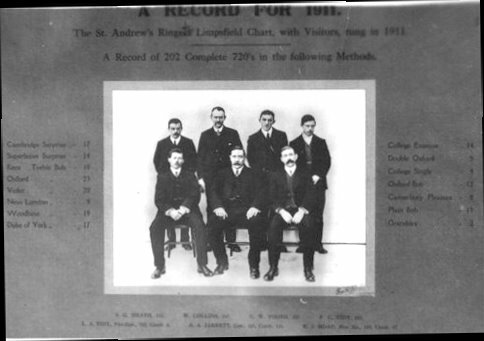 This is a 1911 record of the Bellringers’ Team at St. Andrew’s Church, Limpsfield Chart. Alfred was Captain of The St. Andrew's Bell Ringers in 1911. There are also two Tidy brothers -- Percival and Leonard who are connected to the Jarretts by marriage. Coincidentally, Leonard was the father-in-law of Nancy Tidy - currently living in Cherry Cottage. The copy reads as follows. A Record of 202 *Complete 720’s in the following Methods. *This style of bells and bell-ringing developed in England in the 1600s and remains unique to English-speaking countries (although a similar system arose independently in a small region of Italy). The vast majority of towers with such bells are in England , attached to Church of England churches. This does not imply Webmaster erudition; just the result of a simple look-up. “I found your fascinating site and newsletter - Limpsfield.net - while browsing for information on Limpsfield, where my Great-uncle, Bertie Jarrett (sometimes known as Bob or Robert), lived and worked from around 1915 until his death in 1975. I was particularly interested to read an article about the Jarrett family of Limpsfield, although I am not sure that my Great-uncle was related to them, as he was born in Oxfordshire in 1887. In the 1920s, Bertie worked in, or near, Limpsfield as chauffeur to Sir Leslie Scott, MP and Solicitor General for England and Wales. I believe that later on, he worked for a Sir Ben Cohen in the same area. Bertie's wife was called Dorothy or Dolly. I would like to find out whether the couple had any children. In 1947 they were living C/O Mrs Brown Watson of Limpsfield, and at the time of Bertie's death, their address was No. 2 White Hart Cottages, Limpsfield. Dorothy outlived Bertie, but I don't have any details of her death. I would love to know if any of your readers remember Bertie, Dorothy or any family they might have had. I would be very pleased if anyone could tell me where he worked. 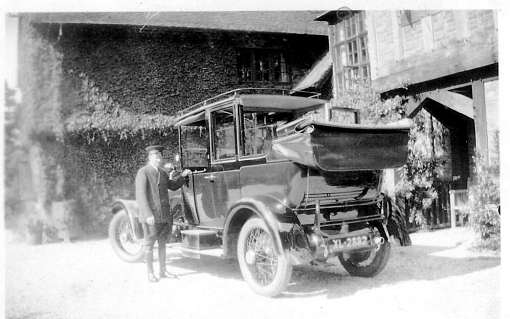 I am attaching a photo of Bertie as a chauffeur, and one of the place where he was living at that time (probably the same building). I have other photos of Bertie and Dorothy if you would like to publish them on your website in the History/Genealogy section. I would be happy to write a more detailed and coherent article if you think it would be of interest! “I hope you don't mind, but I have just found another photo that might be of interest to somebody in Limpsfield. This, together with a couple of other photos of the same wedding (but which I haven't scanned yet), was in the large bag of Jarrett photos that I found in my mum's loft. 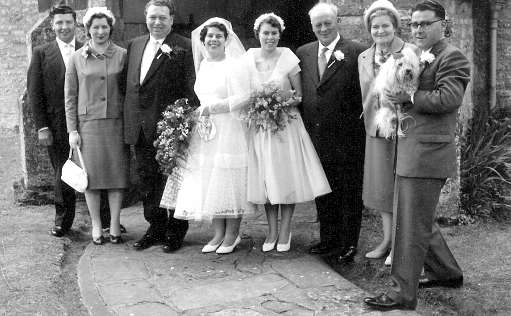 I don't recognise any of the people in this picture, but wonder whether the older couple on the right, standing next to the man with the dog, are Bertie and Dorothy Jarrett. 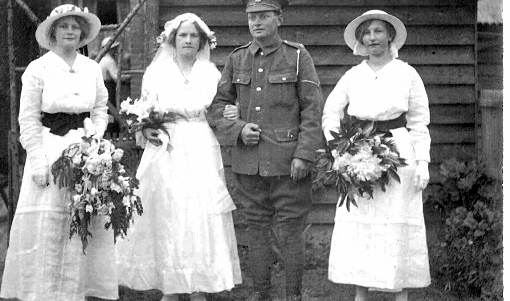 I think the older man's resemblance to Bertie in his own wedding photo of 1915 is particularly striking - I have spent quite a long time comparing the two photos, studying the shape of their faces, brows and ears, and I think it is quite possible. If this is true, are they the bride's parents? And is this Limpsfield or Oxted church? Unfortunately, despite searching, I haven't yet found any BMD records of any children for Dorothy and Bertie, but perhaps this is a start. My great-uncle Bertie James Jarrett was born on 15 April 1887 in Long Hanborough, Oxfordshire. The fourth in a family of twelve children, Bertie was the younger son of John and Louisa Jarrett. I'm not sure of Bertie's 'official' name: on one Census record he is called Robert; on his marriage and death certificates he is Bertie, while photos of him in his sister's album are labelled 'Bob'. By the age of 14, Bertie was working as a farm boy near Woodstock. At the time of his wedding, June 1915, Britain was at war and Bertie was serving in the Army as a Lance Corporal, based at Bulford, Wiltshire. From his hazy photos I have tried to identify his Army cap badge, and believe he belonged to the same cavalry regiment as his older brother: the King's Dragoon Guards.Bertie married Dorothy (also known as Dolly) in Princes Risborough, Buckinghamshire on 22 April 1915. I am not sure where Dorothy lived during the war years, but by the early 1920s the couple had moved to Limpsfield, near Oxted in Surrey. Bertie was employed as chauffeur to Sir Leslie Scott, a Conservative MP who was Solicitor General for England and Wales in 1922. After a bit of on-line research, I discovered that Sir Leslie had lived at 'The Copse', Oxted and later Hall Hill, Oxted - but I can find no further references to these places. The (attached) photo of 'Bob's Home' suggests that Bertie and Dorothy lived in a flat or lodge at Sir Leslie's home. The building to the left of the picture looks like a garage area, with a hosepipe – perhaps for washing the cars! Although this picture seems to be cut off on the left – you can just see the hind leg of a dog – I'm afraid this is all there is. The picture with the beautiful car shows Bertie in his chauffeur's uniform. The building looks as if it might be the main part of the house in the picture of 'Bob's Home' – timber framed with brick infill, and with very similar windows. I believe the gentleman on the horse in the next picture is Bertie. 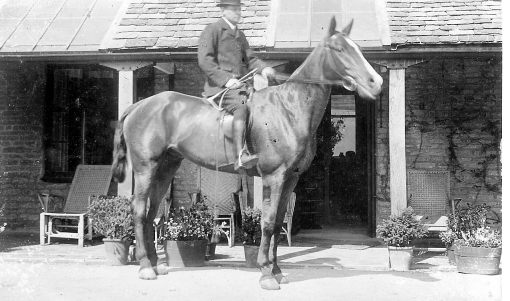 Having served in the cavalry, Bertie was obviously a skilled horseman so perhaps his employer allowed him to ride his horses – or perhaps this was part of his job. The style of the house in the background looks very much like that of other houses I have seen in photos of the Limpsfield area. Reading an old notebook from one of Bertie's younger sisters, I discovered that Bertie later worked for somebody called Sir Ben Cohen, also in Limpsfield. In 1947 Bertie's father died and Bertie was remembered in his will. The contact address for Bertie in this document is: “C/O Mrs. Brown Watson, Limpsfield, Oxted, Surrey”. In their latter years, Bertie and Dorothy were living at No. 2, White Hart Cottages, Limpsfield, and this was their home when Bertie died in the Oxted and Limpsfield Hospital, aged 88. The date was 22 April, 1975: their Diamond wedding anniversary. I am not sure whether Bertie was related to the Limpsfield blacksmith Jarrett/Garrett family (Frank, Arthur and Alfred), or to the John Jarrett from the Limpsfield War Memorial – I'm still researching the Oxfordshire Jarretts' ancestry and it seems to go back a long way in that part of the country. However, I would be very pleased to hear from anyone who remembers Bertie or Dorothy, who knew their children (if they had any), or who recognises any of the houses in the photos. Yes there was a mill but it was on Tally Road next to Mill Lane. Today there two cottages standing in its place 1 and 2 mill cottages. I have seen a photo of the mill,so someone must have a record of the mill. From what I remember, my grandfather Charles Jarrett owned them and the buildings behind and at a later date, Robert Jarrett lived in number one cottage. I know Charles Jarrett was born in the Carpenters Arms and my mother Joyce had the General store in 2/3 Post office row until 1977. You can see it in the photo of the old Post Office at the top of Post Office Row. It used to be the Bakery previous to that. After my mother moved in, it was called Joyce's Stores. The name came from the shop in Limpsfield that my Grand Mother had; its name came about from the soldiers who used to shop there thus 'Joyce's'. The one who could give you more information is my mother, the last remaining of Charles Jarrett's Children. I myself lived there for over 20 years growing up and playing in and around Limpsfield Chart, even going to the same school as in the photo of Limpsfield School. Today I don't live in the UK and am doing this from my apartment in Chongqing, China. As of the article on the Jarrett family there is no mention of George, Arthur or James, better known as Jimmy. He hated to be called James and the air would turn blue if you called him James. A real character in his own way, he was the voice of the betting and coal business and known by many who used to have a bet . He was not a fit man and if you had seen him in Limpsfield village he used an old bike as a walking aid.